Some people call okonomiyaki “Japanese pizza” or “Japanese pancakes.” I found it to be similar to a frittata. Assorted vegetables heaped into a thin egg/flour batter makes this dish a great appetizer or a light meal. I’m sure my version of okonomiyaki is a far cry from the traditional Japanese versions, but I really enjoyed it! Besides, okonomiyaki means “what you like” that is “grilled or cooked” – how accommodating, right? 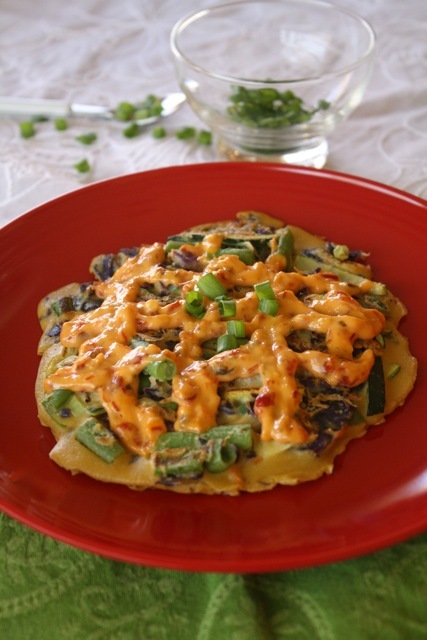 My recipe is loaded with veggies only (okonomiyaki usually includes cabbage as well as other vegetables, but many recipes include meat like pork, or even shrimp and squid, too), and I used Bob’s Red Mill Garbanzo Bean Flour to make it a gluten-free dish. I also made a quick mayo-garlic chili spread to use as a topping (4 tablespoons of mayonnaise mixed with 2 tablespoons of prepared garlic chili sauce). In Japan, brown sauce is used to top the dish, along with a mayonnaise-type sauce drizzled over top in a crosshatch pattern. Seaweed flakes, pickled ginger and Bonito (a type of mackerel) flakes are also sprinkled over the finished dish. The challenge to this dish? Flipping it after the first side is cooked. I know that sounds funny, but it’s harder than you think! Typically, okonomiyaki is cooked on a teppan, or type of griddle. After cooking one side for several minutes, two spatulas are used (for best results) to flip it. I used a large sauté pan to cook mine, and it took me a few flips before I got it right! # In a separate bowl, combine the eggs, stock, salt and pepper, soy sauce and flour. Whisk until smooth. # Spoon about 1/4 cup of the batter into the pan into a rounded form, about six inches in diameter. Cover and cook on one side for about 4 minutes. # When the first side is cooked, use two spatulas to gently flip to the other side. Cover and cook for about 4 minutes. Continue until the batter is used up, adding more oil as needed.